There are twenty-eight bones in the normal adult skull comprising the Cranial group, the Facial group and the Ossicle group of the inner ear hearing mechanism. All these groups of bones mesh into each other like a jig saw puzzle forming an integrated housing for the brain and sensory organs. The brain is like a central computer system that regulates all other systems of the body. A command network of wiring called the Central Nervous System connects to all the remote parts and organs of the body via the spinal column. Our brain interprets information from both internal and external stimuli and reacts in accordance to its innate programs. Our personalities, feelings and responses come from the co-ordination of past experiences and the logical minds' ability to rationalize the consequences of our actions or reactions. 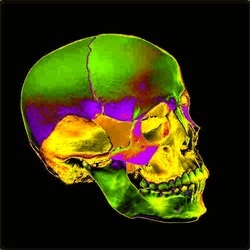 The integrity of the cranial vault housing of our brain and upper central nervous system is vital to the correct functioning of our body's computer command centre. Distortions and mechanical stresses to the housing of the bio-computer can cause malfunctions to the basic program sequencing of the primitive responses of the central nervous system. The central nervous system as mentioned, comprises the brain and spinal cord and may be divided into a hierarchy of centres. The most evolved thinking and integrating part is the cerebral cortex at the top, the next oldest brain, that of instinct, is in the middle and the oldest, the brainstem, lies just above the spinal cord and holds our primal responses. The brainstem holds the nerve centers controlling the primitive reflexes. While still in the womb and in early months of life the higher centers of our central nervous system are not fully developed, but during this time we are protected and assisted by our primitive reflexes. A reflex does not involve thinking; it is an involuntary response. That is: given an external stimulus (e.g. touch, noise, heat) or internal stimulus (e.g. hunger) there is an automatic, involuntary reaction if the relevant reflex is active. Reflex response varies from simple muscular movement (e.g. moving a body part away from pain) to quite complex reflexes involving body movements, breathing, perceptual and hormonal changes. Primitive reflexes are needed for survival and development in the womb and in early months of life. As higher centers begin to develop enough for conscious control of activity, the involuntary, uncontrollable reflex responses become a nuisance, except in special circumstances (e.g. quickly moving a body part away from excessive heat). The reflexes anatomically and neurologically stay for the remainder of our life, but, if all is well, they are integrated into higher centre control. Primitive reflexes normally begin to function in a particular order and are integrated in a specific sequence. If they are retained out of sequence, they may interrupt the development and integration of subsequent reflexes. Should they be retained beyond their normal age of integration they can disturb some or all of the functions of higher centers, including behavior, learning, the control of gross or fine movements and more. Basically, the perception of our internal and external world and our response to it, may be altered, and our conscious life may be disturbed. What causes reflexes to be inappropriately retained? There are no absolute answers but research and experience indicates that trauma of some kind is involved somewhere between conception and early months of life. The trauma can be physical, chemical, hormonal or other forms not yet researched. In the womb during pregnancy many chemicals and hormones can pass through the umbilical cord and all manner of traumatic events can occur in the delicate early months of life. The biggest one appears to be birth trauma, including caesarian section. Statistics and clinical observation show that there may also be genetic factors. These appear to be predispositions to a complicated birth, which raise the probability of problems and subsequent trauma. Should this reflex be retained after birth, it can manifest as withdrawal, reticence at being involved in new and different circumstances, the " fraidy cat " child who may bear the brunt of teasing by normally adventurous children. The child may even scream loud and long when faced with a new situation or perceived threat. This behavior appears to be due to the reflex's involvement with the parasympathetic nervous system. Most of us are familiar with the "fight or flight" adrenalin rush of the sympathetic nervous system. The parasympathetic nervous system is intimately involved with the vagus nerve, and may become mechanically trapped in the chest, abdomen or neck. Release of the vagus nerve entrapment corrects one physical factor, which contributes to retained fear paralysis reflex. Inappropriate retention of the fear paralysis reflex can contribute to such conditions as Sudden Infant Death Syndrome, elective mutism, hypersensitivity to sensory stimuli and may result in physical and psychological conditions such as Panic Disorders and Attention Deficit Disorder. As it begins first and is normally integrated first, retained fear paralysis reflex may effect the integration of any other primitive reflex. The reflex is set off by excessive information in any of the baby's senses. For example, a loud noise, bright light, sudden rough touch, sudden stimulation of the balance mechanism such as dropping or tilting, turns on this "one reflex suits all" reaction. The reflex has to cover all eventualities so the child's "fight or flight" "adrenalin rush" hormonal and neurological response is turned on, preparing the child's body for whatever triggered its alarm system. If the Moro reflex persists beyond six months of age, it may become automatic and therefore an uncontrollable overreaction, thus overriding even the newly acquired higher centre of decision making. Because the reflex stimulates fight or flight reactions, these responses may happen inappropriately from anything in the person's environment. Fight or flight responses stimulate the body ready for fighting or for running so the child may be an aggressive, over-reactive, highly excitable person, unable to turn off and relax. These responses are for pure survival, for very focused fighting or running, not for being perceptive, sensitive or noting the subtleties of circumstances, thus the person may have difficulty functioning socially (which includes the schoolroom, playground, workplace etc.). The child may be very difficult to understand, although they may be loving, perceptive and imaginative at times, yet at the same time, be immature, over-reactive and aggressive. The fight or flight adrenalin response may be inappropriately turned on many times a day and is on standby most of the time, therefore placing a constant demand on the adrenal glands, which may become fatigued. These glands are very important for the immune system and if they are fatigued, can lead to allergy and chronic illness. Cranial Osteopathy is the technique of recognizing and correcting faults in the interlocking cranial plates housing the brain. It is these subtle distortions in the cranial vault that triggers the activation of retained primitive reflexes and subsequent inappropriate behavioral responses. Cranial corrections may help children and adults with ADD. and ADHD. behavioral problems. Migraine syndrome may be a result of a cranial fixation pattern and thereby potentially helped with cranial release therapy.